Reaching Records LLC is a for-profit Christian, independent record company based in Colorado Springs, CO that produces inspirational music projects to benefit both humanitarian and faith-based organizations. Reaching Records was conceived June 1994 in Oakland, CA. Founder and President, John Redmon started this unique label in his grandmother’s living room to “reach and touch hearts around the world”. He was 18 years old. John Paul Redmon (also known both professionally and sentimentally as JRed) was born May 8, 1975 and is the founder, president and CEO of Reaching Records LLC — a Christian, independent record label based in Colorado Springs, CO. Redmon is also an American inspirational artist, pianist, singer, composer, arranger, motivational speaker, and humanitarian. Mother, Cynthia Redmon, was an accomplished pianist that found joy playing for home church and became young Redmon’s first piano teacher. “John was about 5 years old, and I would sit on the piano bench at church and sit him next to me. I would play a song with both hands on the piano, and John would play the melody of the song with one finger” states Ms. Redmon. Age 9, John took his first piano lesson at Golden Gate Academy, a private, Christian school where Redmon, his twin sister Esther and elder sister Mary attended for twelve years. His piano teachers from ages 9-12 were in fact the school’s music teachers. His piano teachers were Janice McRae (White), Bronwynn Watkins (Crutchfield) and Raymond Davis. Music mentors later included Teri L. Simmons and the late John Bowen. By age 12, Redmon developed another passion…writing music. Recognizing this new desire, Redmon was not only being strongly encouraged by his mother and his piano instructors to play proficiently both by ear and sight, but also to compose his own original music. Age 18, Redmon decided to not just compose but house his original works within his own independent record label. He named the company Reaching Records. The motto and mission of the label was to ‘reach and touch hearts around the world.’ For the next twenty years, Redmon produced and released multiple projects on this label that gained national attention and recognition, including: A Woman’s Journey (featuring Full Assurance with the “rousing opening cut” Praise the Lord!, Grammy Award Nominees Vickie Winans and Brenda Nicholas); John Redmon & Friends: Faith, Love and Unity, Vol 1 (Independent Music Award Nominated Album featuring BeBe and CeCe Winans, Daniel Winans, Phil and Brenda Nicholas and Grammy Award winner Patti Labelle); S’Agapo(“…a fantastic collection of R&B songs”); and Thank You Lord (Story of the Shunamite Woman) — his biggest and most successful/notable single release. Redmon has toured throughout the United States and England with his inspirational messages found in both word and song. He testifies and believes that his latter days are going to be greater than his past. From grades 1-12, Redmon attended Golden Gate Academy (a private, Seventh-day Adventist school based in Oakland, CA). In 1993, he graduated his senior class as valedictorian. He began his undergraduate studies at Peralta Community Colleges from 1993-1995. 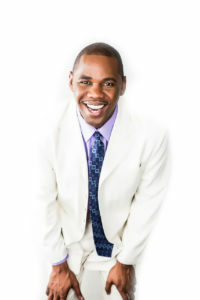 In 1996, Redmon transferred to Oakwood College (now Oakwood University) in Huntsville, AL, where he joined the singing recruitment group for the college called Positive Images (Evelyn Fordham-Goodman, Dana Arceneaux, Keith Goodman, Danielle Story, Bruce Williams, Jr., Tiffany Franklin, John Redmon, Heather Trotter-Martin). From 1997-1999, Redmon attended and graduated with his Associates degree in General Studies from Calhoun Community College in Decatur, AL. He also received the prestigious Top Ten Most Outstanding Students Award from that same college. In 1999, he enrolled in Athens State University (Athens, AL) where he received his Bachelors of Science degree in Computer Information Systems in 2001. When Redmon is not touring with his music around the country, he is providing private piano lessons in homes, scoring music, enjoying being Music Instructor at Springs Adventist Academy, Minister of Music at both Fresh Start Baptist Church and Central SDA Church in Colorado Springs, CO. In his down time, Redmon finds joy driving for both Lyft and Uber taxi services. He calls these adventures “Church on Wheels”.